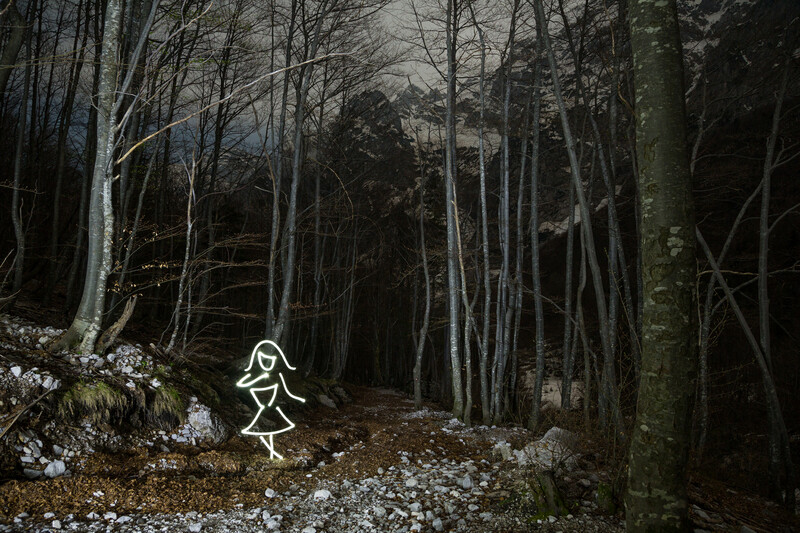 A second light painting from this month’s Slovenia trip. Once again, everything is in camera – the girl is hand drawn with a mid power CREE LED using a baby’s sock as a diffuser, and the forest is light with a few low sweeps of a Lenser MT-7 LED. The MT-7 is ridiculously powerful, and I probably went a touch over exposed in place here, yet it kind of works with the noir subject. My one regret is that this is really half of the image. I really wanted to add something pursuing her. With six frames like this one in the bag I was experimenting with what that might be, when a frenzied, bestial screaming erupted frighteningly near at hand in the dark woods. This is shot way up the Logarska Dolina valley, on the walk up to the Rinka waterfall (Slap Rinka), with no one nearby. It was pretty terrifying and saw me flee the scene, pretty much as you see her running here – just downhill instead of up. As I threw myself into the car my flashlight swept over some of my kit at point blank range and I got the perfect idea for what could be chasing her. I paused in the car… a grim silence punctuated by occasional wet, wheezing barks of panic and despairing screams. Christ knows what it was – a wild pig or deer meeting its end I would guess. Anyway – the shoot was over for that night. I’ll be posting more of Logarska Dolina – it’s an incredible part of the world, which I highly recommend. If you go and you’re looking for a place to stay, I’d offer a massive endorsement of Lenar Tourist Farm. We’ve stayed there twice now; the rooms are spotless, the views breathtaking, the people wonderful and the breakfasts the best we’ve enjoyed at any hotel anywhere. And there are animals. Go! Just don’t use Europcar to get to them; their customer service department leave a great deal to be desired. There is still no resolution to the issue noted in previous posts. Hope everyone is having a fantastic week – I’m catching up over the next couple of days… month end, thus busy. Look forward to seeing your work too.